100% pure, organic orange juice to plebeian for you? Check this out. What else is the tangerine but the perfect example of the forgotten also-ran. At some point in the unknown past man stood over the Ur-carafe, his hand wavering for a moment between two nearly identical citrus fruits, and for reasons lost to us now, it was the orange he chose to squeeze for his morning juice forever more. There is an alternate universes where all coin flips came up opposite, all substance is made from anti-matter, cash is based upon the silver standard, Oswald the Lucky Rabbit towers over Mickey Mouse and people wouldn’t dream of having breakfast without a glass of fresh-squeezed TJ. 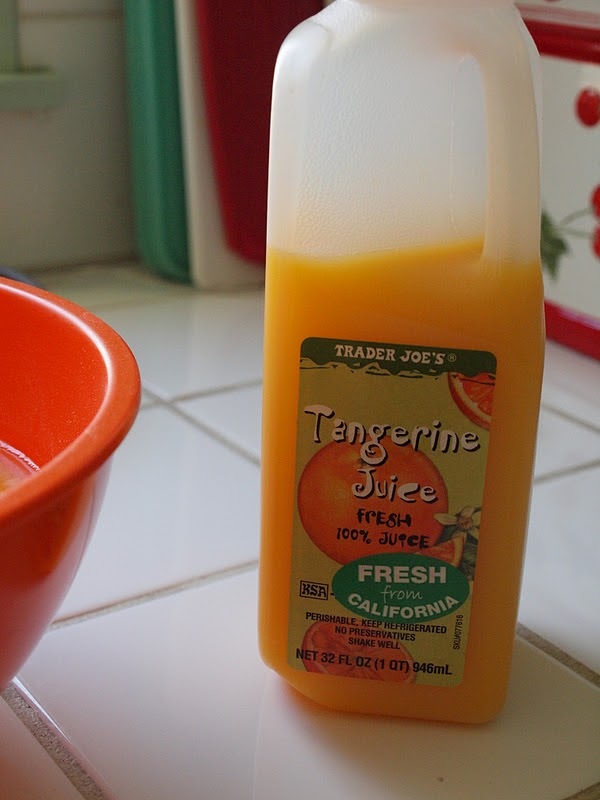 It’s beyond me to imagine what the Trader Joe’s bigwigs were thinking when they decided to stock their shelves with a juice that 95% of the population will automatically pass up in favor of good ol’ orange juice, but whatever the reason is I decided to honor it with a purchase this week. Practically, the tangerine is almost as near to the orange as it is possible to come. I will say, first and foremost, that I prefer the color of tangerine juice to your ordinary store boat orange juice. It’s hue is just slightly more rich, almost imperceptibly closer to red, than a glass of Florida’s best. I expected much the same from the taste. The tangerine is, after all, close cousin to the orange, there is even debate in scientific communities over whether the tangerine is it’s own species or just a variety of orange. If scientists can’t tell the difference, how different could 100% TJ be from OJ? Markedly different, is the answer.The same citrus bite is there, particularly on the top note as it graces the tongue, but the heart note and follow through are both startlingly bitter. 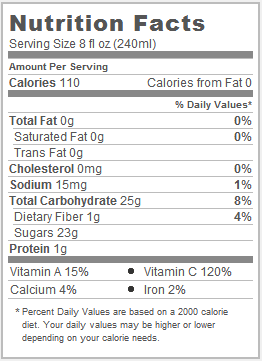 If I had to make a tangerine juice stand-in, I would go for a 70/30 OJ, grapefruit juice split – it’s that bitter. But, if I may say so, bitter in a good way. As is so often the case with pure juices tangerine juice is a complex and engrossing taste. It is not chiefly bitter, so much as it is interestingly bitter. Orange juice, like apple juice, can be at times too sweet. Tangerine juice is a sipping drink, and drinks that insist on being sipped are perfect for people who love juice, but fear the massive caloric load inherent in a big glass of juice. I tend to guzzle purely sweet drinks, and so I never tempt myself with large cartons of orange juice in the fridge. This drink packs just enough of a punch to make me sit up, pay attention, and set the cup back down. The perfect replacement for a breakfast juice or, in a pinch, the perfect way to mask a particularly strong mixed drink. Would I Recommend It: Yes, particularly to iconoclasts. Would I Buy It Again: Absolutely, seasonal if nothing else. Final Synopsis: Orange juice’s older, more refined brother.